We met a lot of people that are into fitness, hiking, and just leading a healthy lifestyle! 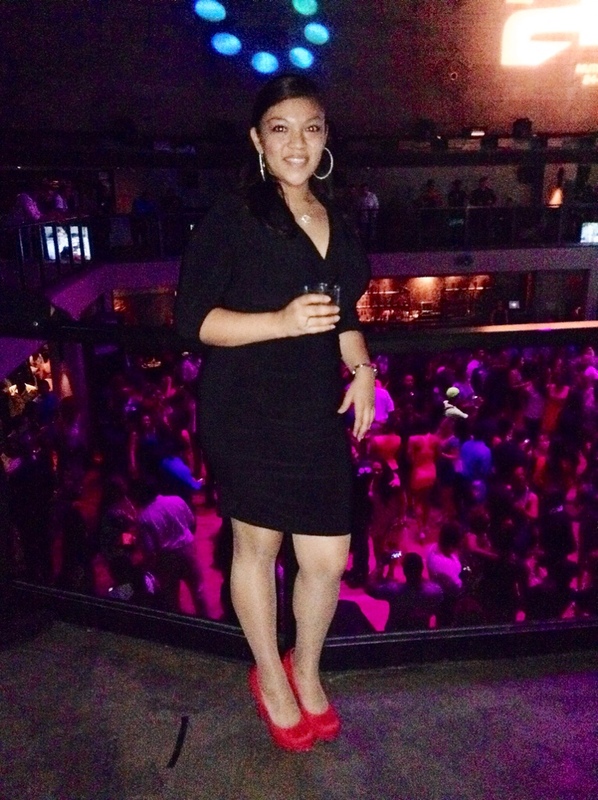 We danced a little, I have yet to get used to dancing in heels, but we danced! 🙂 We had a great time and I feel amazing ! I enjoy NOT having to bind my projects, so I do it the easy way : placing your two fabrics right side together onto of batting, sewing all around leaving an opening for turning. I used a piece of batting I had laying around folded over, measuring 30×20″. 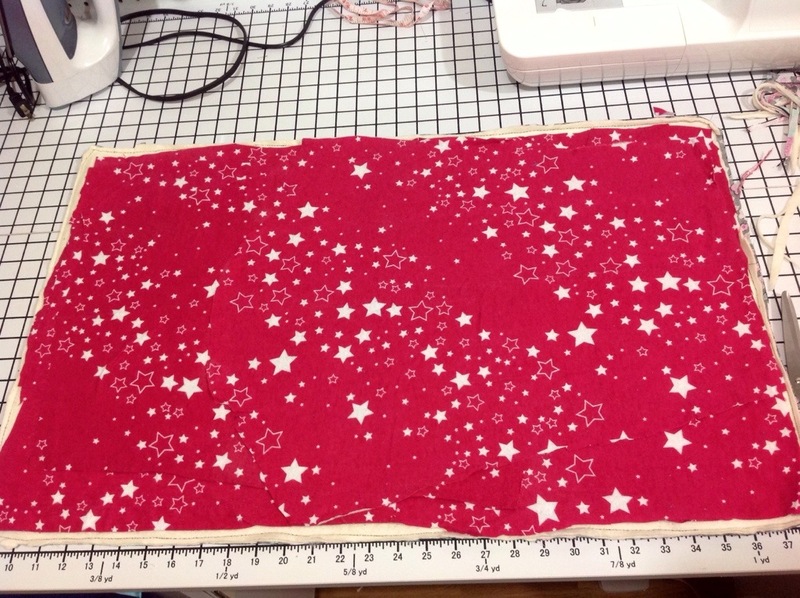 After getting my top and bottom fabric right sides together and on top of the batting, I sewed all around leaving an opening. Although, after I turned it right side out, it wasn’t as plush as I’d like it to be.. And I was racking my brain as to how to make it more plush and comfortable for Jeanie. 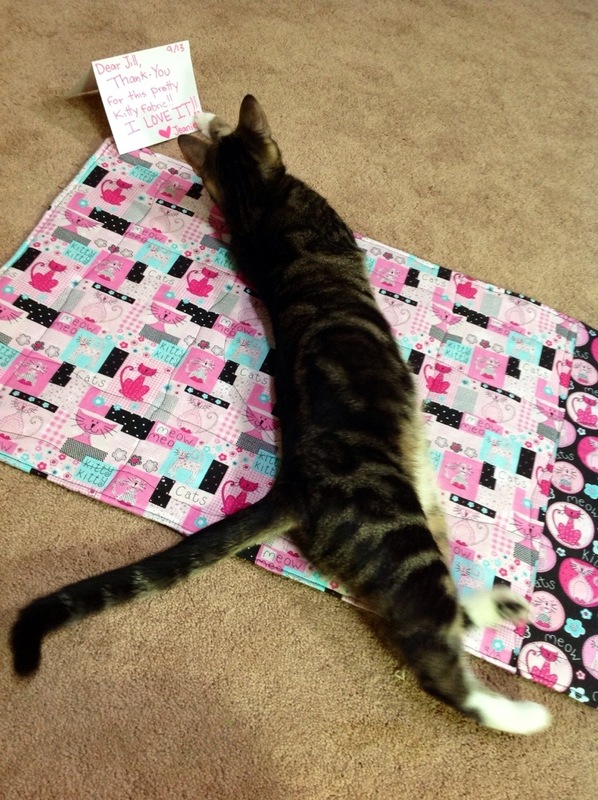 I do have fiberfill, but I knew I wanted to quilt this play mat, so I didn’t use fiberfill. I wouldn’t know where to begin working with fiberfill. I happen to collect all the pajama tops I never wear from those pajama sets, so I have a lot of flannel pajama tops. 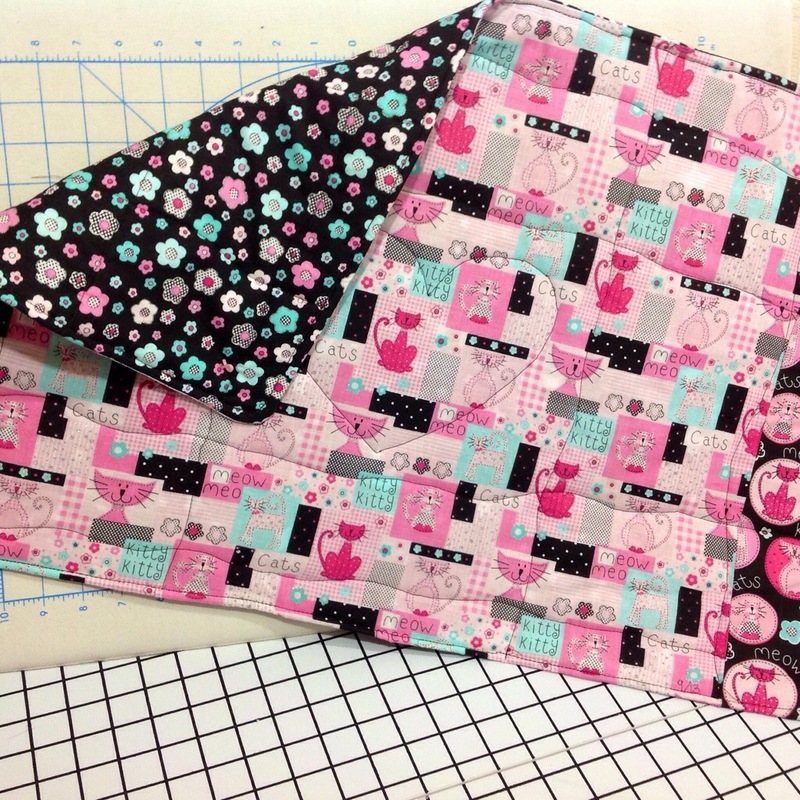 I cut some buttons off when I’m making pincushions, or cut a piece of the sleeve for patching up my pajama bottoms. 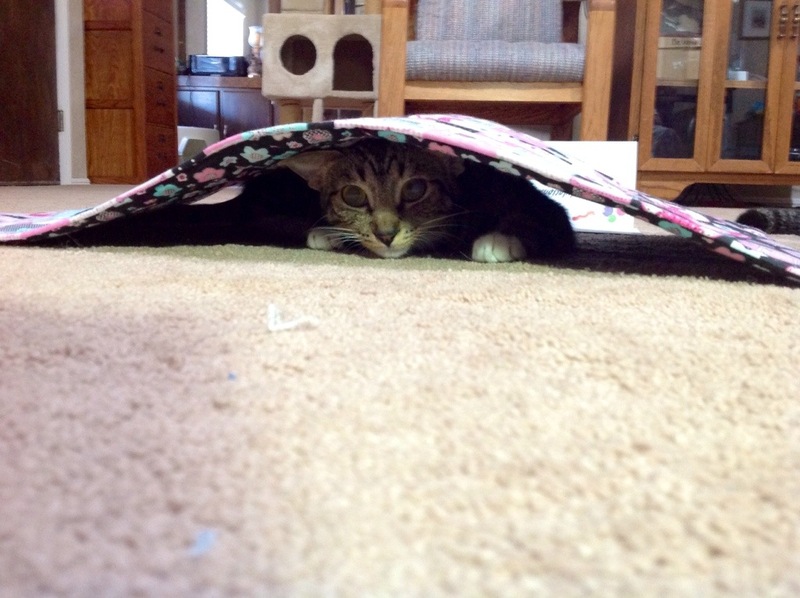 When I was looking for something to “plush” up Jeanie’s play mat, it hit me!!! 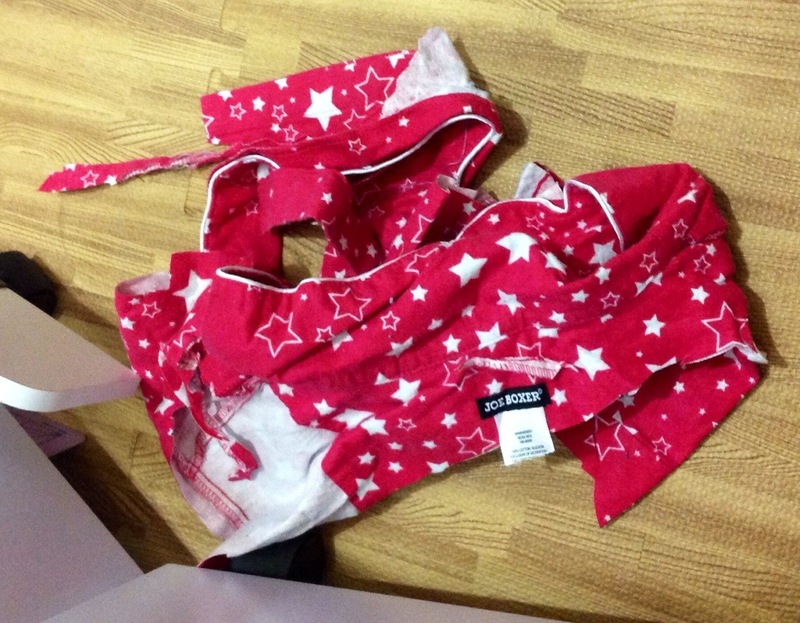 Adhere pieces of flannel pajama tops on it!! And it worked just fine!! 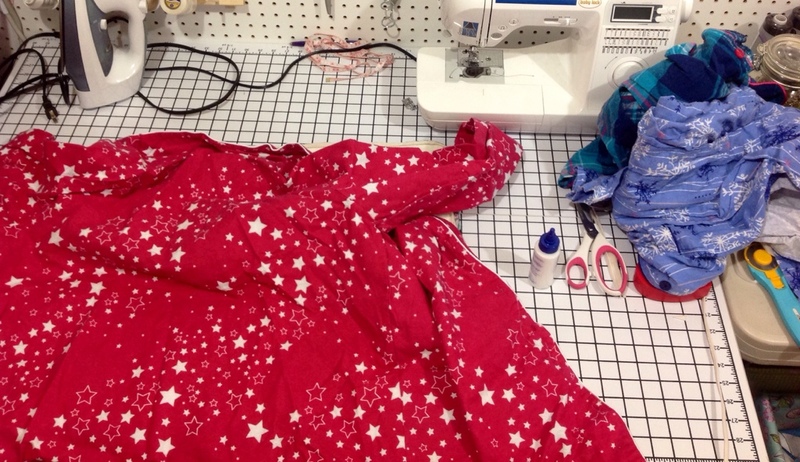 I used up one whole pajama top, cutting the back in half to fit the play mat, cutting the sleeves open, and even used the front pieces and cut off the pockets for a little more plus. 🙂 I used basting spray adhesive and loved it! 🙂 I turned the mat right side out, sewed it closed, and got to quilting! 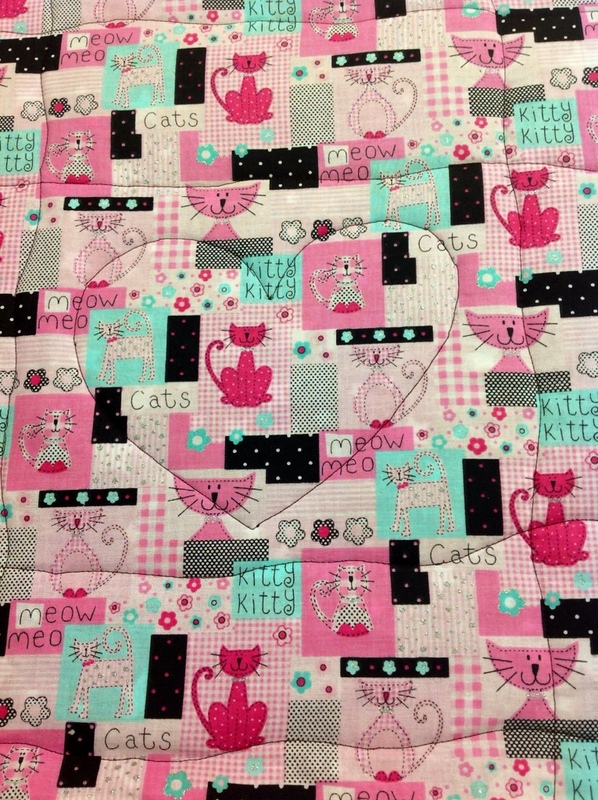 This was my first attempt at “free-motion” quilting, using my quilting foot. 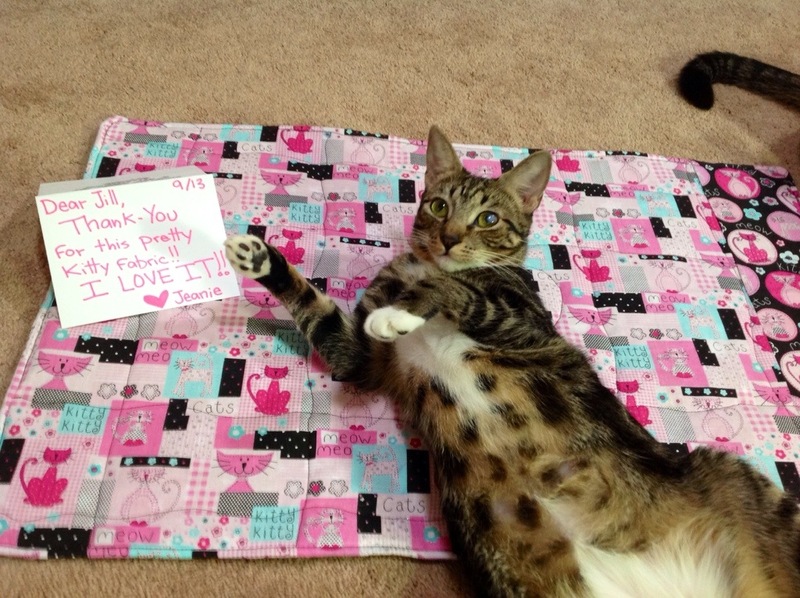 I quilted a heart in the center of the play mat, and criss-cross lines around it. Not too shabby, huh? 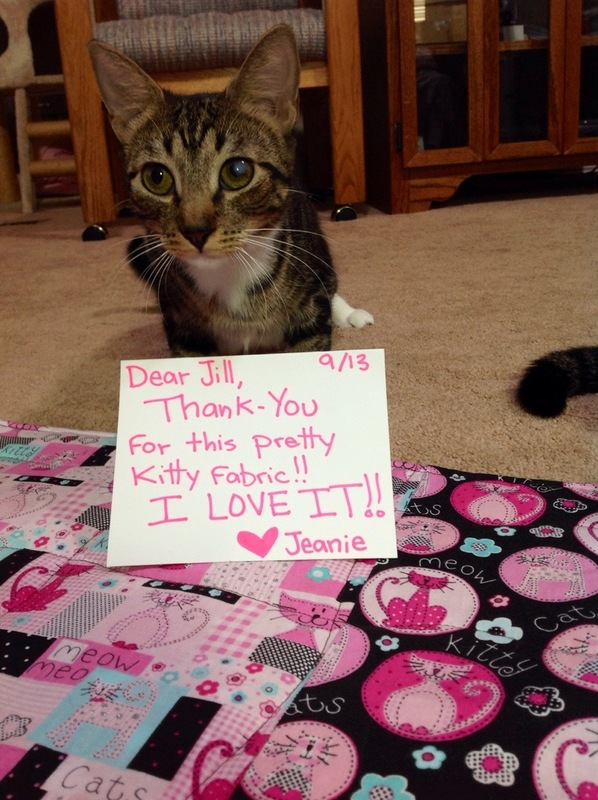 I made a little note for Jill, Jeanie wanted to thank her for the adorable kitty fabric! Isn’t she just too darn cute?! 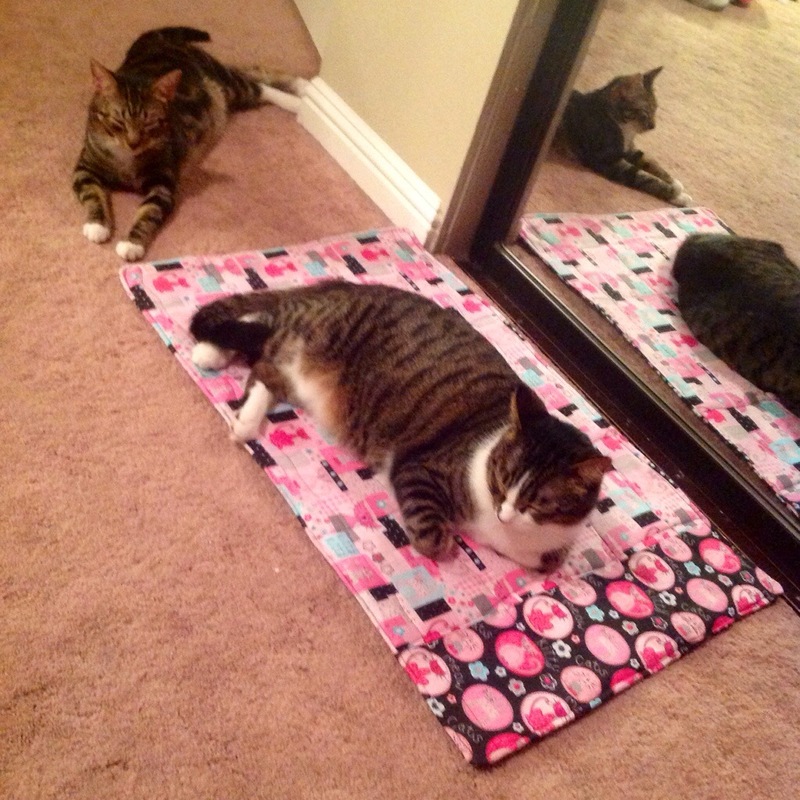 Ray decided the mat would quickly be his , so he slept on it all night last night, while Jeanie slept next to Ray sleeping on HER mat! 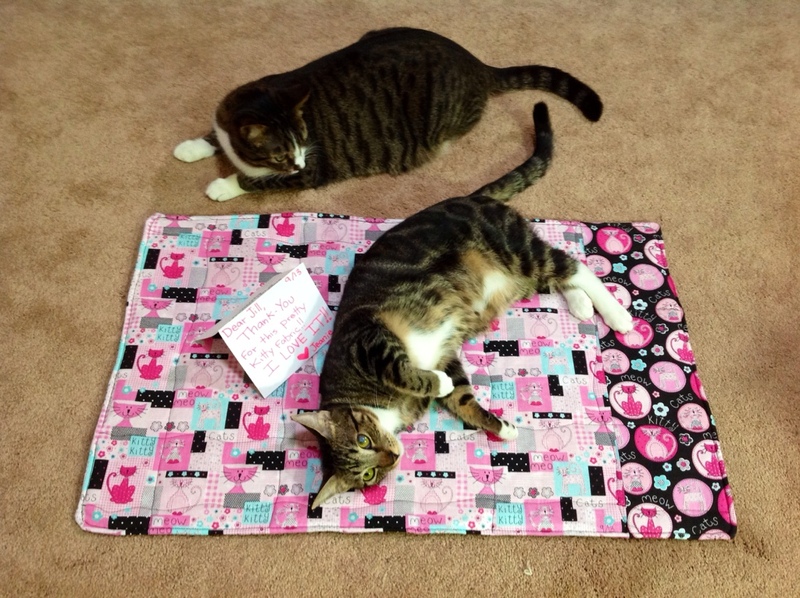 Do you make something for your babies (children or furrbabies) and your OTHER baby takes it away? Lol then you’re stuck making two of everything, huh? 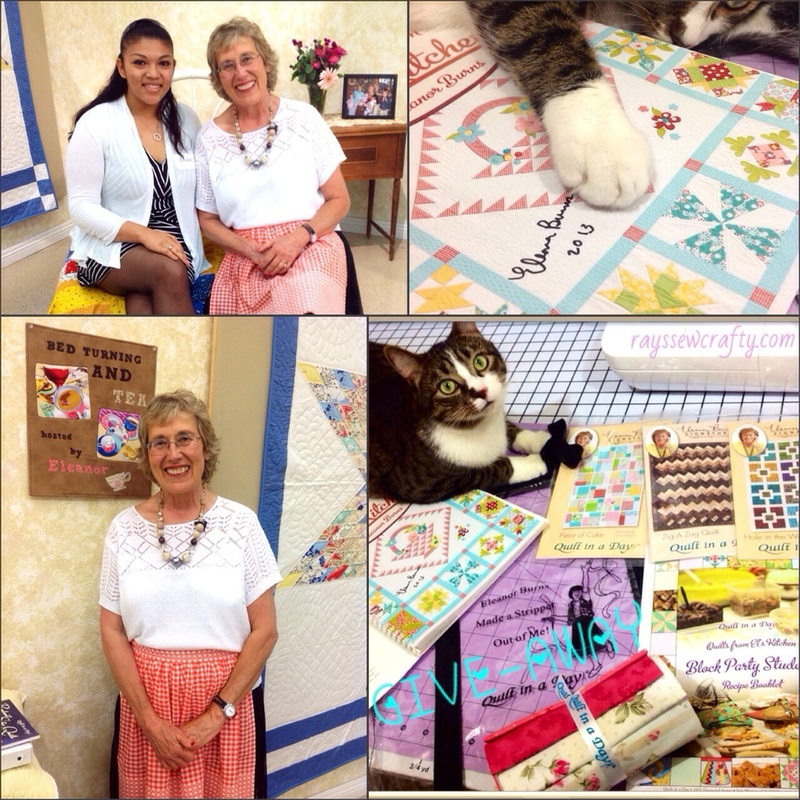 If you are obsessed with ANYTHING quilts, then you should go to my previous post “Bed Turning and Tea hosted by Eleanor Burns AND a GIVEAWAY” where you can watch Eleanor show us her massive collection of vintage quilts, antique and original quilt patterns and so much more! I took SOME pictures, but the links to the video is in that post. I encourage you to check it out, and it’s such a fun, fact-filled event! 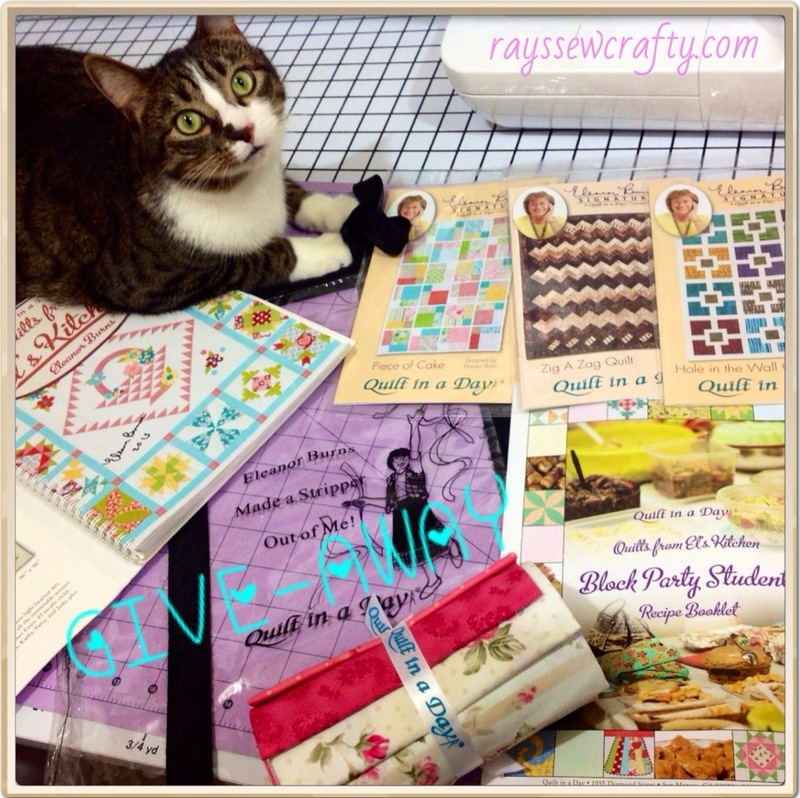 She goes over some of the original quilters that started it all, showing us original copies of the first quilting book to be published, and so many fun stories behind the quilts she’s showing! So again, check out that event AS WELL as enter for a chance to win that goodie bag! It really is a priceless prize: an autographed copy of El’s newest book “Quilts from El’s Kitchen” , some Eleanor Burns signature quilt patterns, a pastry recipe booklet, a clear zippered tote that says “Eleanor Burns made a stripper out of me! 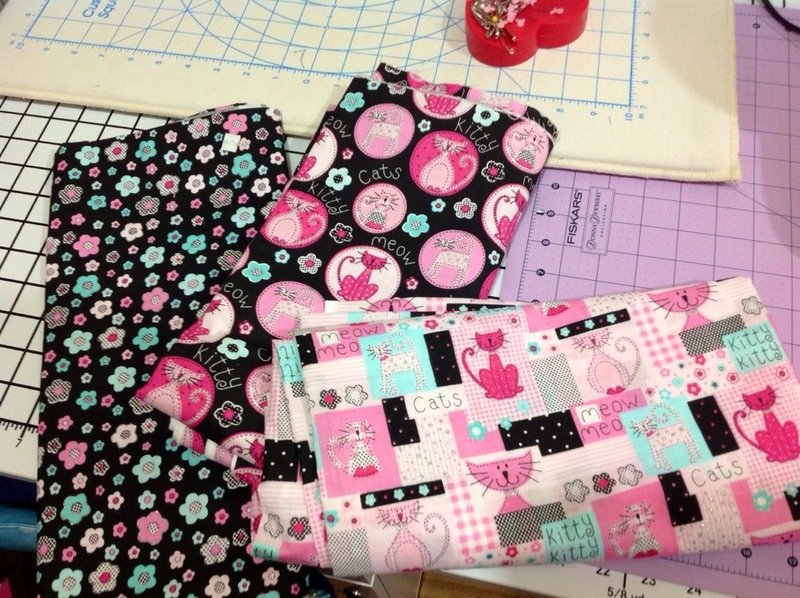 !” AND a pretty pink fat quarter fabric bundle, how neat is that?!? Thank you so much for reading and all of your support! I really appreciate it!